In 1989, a family was beginning to build their dream home on their six-acre property. At the lock-up stage of construction, unusually heavy rains caused a massive landslide below the house that left it standing a few feet from the edge of a sheer clay drop of about 300 feet to the creek below. The advice of soil engineers was, "Move the house before it goes down. It is only a matter of time. Nothing can be done to save it." It was a traumatic time of confusion, but following the only option given, they made arrangements to move the house. Strangely, they could not feel at peace with their decision and cancelled the move a few days before the scheduled moving date. They clung to that in the face of all the well-meaning, contrary advice of family and friends. During the process he said, “There were times when my faith in God's promise would waver, and doubt would creep in. I would wonder if perhaps everyone was right -- was I crazy to hold on? But when these doubts would come, I did something that seems unreasonable. I would walk to the edge of the slide and look down on what had turned men's faces white when they first saw it. The house still stands. 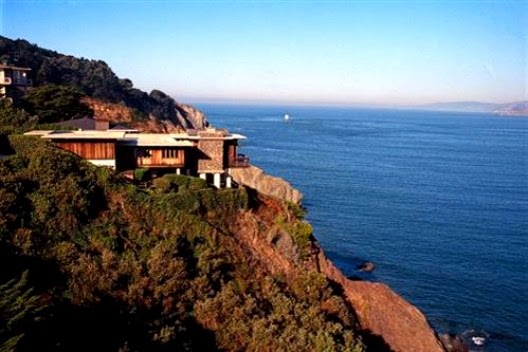 Many years after the slide, the bank had completely regrown, and when they sold it a few years ago, the buyer had no concern for the safety of the house. How different our lives would be if we developed the habit of standing still awhile -- even in the frightening place -- until we heard the voice of God. In our hectic world of change, endless appointments, busy schedules, and information overload, have we forgotten how to take time to simply stand awhile and listen? Dear Lord, we come to stand before Your throne and ask that You teach us to become still, that we may hear Your voice above all the noise. In Jesus’ Name, Amen. Do You Take the Time to Care? Will You Be the Legs, Arms or Eyes Today? Are You In The Fog? Do You Feel Alone and Desperate? When We Are Suffering We Are Not Alone. Do You Feel Like You are Alone? Is Your Mouth Filled With Worthwhile Stuff? Sheep Listen to My Voice. Do You Hear What is Really Important? Do You Stop to Listen?